Looking for a Great option for your next in-house field trip? Why not add a bit of magic! Fun, laughter, and enthralled children mean happy kids, happy staff, and happy moms and dads. "Thank You so much! Our friends really enjoyed your magic show! Kept them engaged for the whole hour. Hope to see you next year! " "Thanks so much Scott! You do a great job & never fail to engage & entertain the children! 8 years WOW"
"Thank you so much for coming out to do a show for us last week. ...all of the teachers had rave reviews!" "Thank you for coming to our school! The teachers and children both REALLY, REALLY enjoyed your show! ... We will gladly share how wonderful our experience was yesterday. Hopefully we can have you return sometime soon, possibly for one of our weekly summer field trips!" "I wanted to again thank you for coming to Gifford to perform for the Kindergarten children. We really enjoyed the program!! You are awesome with the children and they talked about the show for the rest of the day! Have a wonderful summer and we hope to see you again next year!! " "Thank you for the two wonderful performances on our summer kick-off day. The children were literally shaking with laughter. ... The approximately 350 children and adults at each show greatly enjoyed your performances. A Day Care Assistant told me that you were great, "One of the best she has seen." Your program was so good because the kids are such a big part of it. They enjoyed playing the critic and participating in the jokes and tricks." "Laughter and bright smiling faces are the first thoughts that come to mind when I think of Scott's magic show. Although, Scott caters his magic shows to children, the parents and staff also watch in awe and amazement as he performs his magic. I have asked Scott to come to my day care (KinderCare) ... Each time, he has been flexible with my centers needs and with a time frame. I plan to have him back again in the summer months, and have his card on file for whatever child event may arise. I highly recommend Scott's Magic show to anyone with children." Bring wonder and fun to your children with Great Scott's "All Around Fun Party Show". Plenty of fun, lots of magic, an abundance of child interaction, appropriate child-centered music, stories, and a visit from one of the many fun-loving puppets that travel with Scott. Invite the 2 year olds and the 12 year olds. Yes, that's quite a span in ages, but Scott's show has something for everyone. Think of it as a variety show for kids! Magic, music, puppets -- even ventriloquism. Children and adults will not just sit, but truly enjoy Scott's performance. Children remember Scott and his monkey puppet Max or his friendly monster puppet Harry -- or any of the other characters that might come along for the show. You won't be disappointed. In fact once he performs, Scott is always invited back. You'll see. . . go ahead and give him a call. The rates are very reasonable for such a quality show. In the fall you can invite Scott to your daycare or preschool to entertain the wee ones with his Goofy Monster Magic show. Nothing scary about this magic show though. Gentle approach to get kids involved and laughing and pointing and 'correcting' the magician. Kids don't get a chance to be in control of much in the preschool years. But when they can, children love to let you know what they can do. 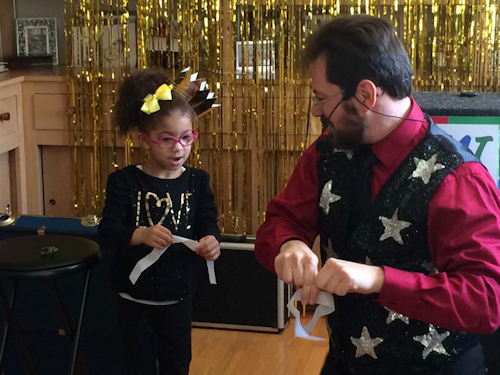 This magic show is designed to let the kids have fun and exercise their "I know something you don't" thinking. Goofy monsters or ghosts will make their appearance (or disappearance), but sometimes the magic just goes wrong for Scott. And of course the kids will delight in helping this poor, misguided magician. Fun characters, music, stories, and magic. Then in the winter you can have the Winter Wonder Fun Show come to your preschool or day-care center. This show lasts 45-50 minutes and it is designed especially for preschool aged children. It features some of the imagery from winter like Frosty the snow man and Rudolph. We'll even start things off with an imaginary trip to the North Pole! After a few months of indoor playtime, and more to come, everyone needs a break -- something different to look forward to. That's why Great Scott has integrated magic, music, puppets, and story telling into a wonder-filled show for preschool aged children. But the staff will enjoy it too. Audience participation, laughter, funny business, and some baffling magic are all part of the show, but the main ingredient in this show is fun. Are you the Director of a preschool or daycare center in Southeastern Wisonsin? Then Great Scott is the entertainer to call. See the children filled with laughter and wide-eyed children. Imagine the feeling of wonder when magic takes place right in front of their -- or in there hands. You don't have to imagine it. Scott will bring the show to your class. Great Scott performs preschool magic shows from Milwaukee to Kenosha, Beloit to Madison -- and more. Just call and ask. 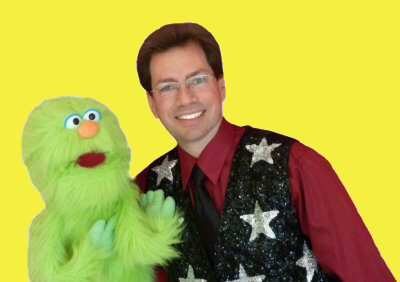 He's a full-time family entertainer and knows what will entertain children of all ages. Each show is filled with plenty of amazing magic. And there is always a visit from one of his lovable puppet characters. Kids love them. Invite Scott to come to your center and present one of his wonder-filled magic shows designed especially for young children. Or if there is a day when the older children (school age) will be in attendance, Scott has just the show for them as well. Call today and reserve your date.